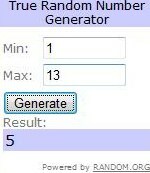 Winner has 48hrs to respond to my email, or another winner gets selected by random.org. I am now an email subscriber! Thanks to Mailbox Monday! Hello and Happy Monday! I am your newest follower.